Hedgeye - Dear Jim Cramer, Remember This Beauty? Dear Jim Cramer, Remember This Beauty? This week marks the 10-year anniversary of Lehman Brothers' collapse. The financial news media and so-called "market experts" are doing their usual backslapping and "lessons learned" thought pieces. Let's look back at what one of the Old Wall media's biggest clowns was actually saying back then. On March 11, 2008, Mad Money host Jim Cramer (who believe it or not is still on CNBC) told a viewer who wrote into his show, "Bear Stearns was fine!" right before the stock absolutely collapsed. The stock was trading at $62 per share. Just 5 days later, the firm was mercy folded into JPMorgan Chase (read: bailed out) at $2 per share. This is an embarrassment. And it undoubtedly caused considerable pain for CNBC viewers who followed Cramer's advice. With financial "advice" like this, it's no wonder the network's ratings are hitting multi-decade lows. 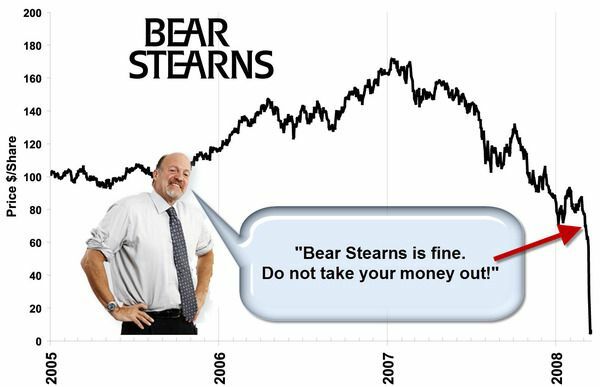 Bear Stearns is fine. Do not take your money out. If there’s one takeaway, Bear Stearns is not in trouble. I mean, if anything, they’re more likely to be taken over. Don’t move your money from Bear. That’s just being silly. Don’t be silly.